In Part Two of our series examining how the candidates have changed their minds on the issues, CBSNews.com Chief Political Writer David Paul Kuhn looks at John Kerry's most notable flip-flops. Following Iraq's invasion of Kuwait in January 1991, Kerry broke with the majority of senators and voted against authorizing the first Gulf War. He said on the Senate floor, "It is a vote about war because whether or not the president exercises his power, we will have no further say after this vote." Kerry thus voted against war after Iraq took aggressive military action. He said a vote in favor of military action was tantamount to giving Congress "no further say" on the war. In October 2002, he supported the current war in Iraq, despite the fact that Iraq took no aggressive action against its neighbors. In announcing his candidacy for president, in September 2003, he said his October 2002 vote was simply "to threaten" the use of force, apparently backtracking from his belief in 1991 that such a vote would grant the president an open-ended ticket to wage war. "We should not have gone to war knowing the information that we know today," Kerry said Wednesday on ABC's "Good Morning America." "Knowing there was no imminent threat to America, knowing there were no weapons of mass destruction, knowing there was no connection of Saddam Hussein to al Qaeda, I would not have gone to war. That's plain and simple." But on Aug. 9, 2004, when asked if he would still have gone to war knowing Saddam Hussein did not possess weapons of mass destruction, Kerry said: "Yes, I would have voted for the authority. I believe it was the right authority for a president to have." Speaking to reporters at the edge of the Grand Canyon, he added: "[Although] I would have done this very differently from the way President Bush has." The Kerry campaign says voting to authorize the war in Iraq is different from deciding diplomacy has failed and waging war. But Kerry's nuanced position has contradicted itself on whether it was right or wrong to wage the war. In May 2003, at the first Democratic primary debate, John Kerry said his vote authorizing the president to use force was the "right decision" though he would have "preferred if we had given diplomacy a greater opportunity." But then in January 2004, Kerry began to run as anti-war candidate, saying, "I don't believe the president took us to war as he should have." In September 2003, Kerry implied that voting against wartime funding bills was equivalent to abandoning the troops. "I don't think any United States senator is going to abandon our troops and recklessly leave Iraq to whatever follows as a result of simply cutting and running," he said. Then, in October 2003, a year after voting to support the use of force in Iraq, Kerry voted against an $87 billion supplemental funding bill for U.S. troops in Iraq and Afghanistan. He did support an alternative bill that funded the $87 billion by cutting some of President Bush's tax cuts. But when it was apparent the alternative bill would not pass, he decided to go on record as not supporting the legislation to fund soldiers. Kerry complicated matters with his now infamous words, "I actually did vote for the $87 billion before I voted against it." On Wednesday, he acknowledged that his explanation of his Iraq war votes was "one of those inarticulate moments." 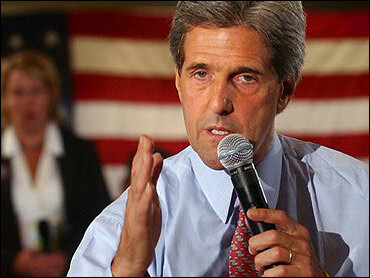 In October 2003, Kerry said Israel's unilateral construction of a security fence was "a barrier to peace." "I know how disheartened Palestinians are by the decision to build the barrier off the Green Line," he told the Arab American Institute National Leadership Conference. "We don't need another barrier to peace. Provocative and counterproductive measures only harm Israelis." But less than a year later, in February 2004, he reversed himself, calling the fence "a legitimate act of self-defense," and saying "President Bush is rightly discussing with Israel the exact route of the fence to minimize the hardship it causes innocent Palestinians." Kerry joined with 97 other senators and voted for the Patriot Act in October 2001. Campaigning in New Hampshire in June 2003, he defended his vote, saying, "it has to do with things that really were quite necessary in the wake of what happened on Sept. 11." But last December in Iowa, Kerry advocated "replacing the Patriot Act with a new law that protects our people and our liberties at the same time." In 1996, then- Massachusetts Gov. William Weld asked Kerry, a longtime opponent of capital punishment, whether the death penalty should be applied to terrorists. Kerry replied that the idea amounted to a "terrorist protection policy." He said then that such a policy would discourage other nations from extraditing suspects because many U.S. allies preclude extradition to countries that impose the death penalty. Kerry now favors the death penalty for terrorists, though extradition remains a problem. Kerry still opposes the death penalty in general, but says if elected he would not interfere with state executions. In 2000, Kerry called the release of oil from the Strategic Petroleum Reserve "not relevant" to solving the problem with high fuel prices. But in recent months, Kerry has pressured President Bush to start pumping oil into the government's emergency reserves. Kerry has called for the release of some of the reserves, as well. In a switch from his earlier position, Kerry now argues that a sizable release would lessen U.S. demand and thereby fuel lower prices. Though he has long supported affirmative action, in a speech at Yale University in 1992, Kerry called the program "inherently limited and divisive," and said it had "kept America thinking in racial terms." He added that it was failing those most in need of assistance: African-Americans. At the height of the Democratic primary race in January, Kerry reiterated his support for affirmative action. Kerry's critics question how he can support a program that he once called "divisive." Kerry says he was speaking about racial quotas, which he opposes. Kerry backed trade pacts with Chile, Singapore and Africa. In 2000, he voted to grant China most-favored-nation trading status. Having supported the major trade deals of the last decade – including the 1993 North American Free Trade Agreement (NAFTA) – Kerry was heavily critical of U.S. trade policy during the Democratic primaries. As the primary race heated up against now vice-presidential nominee John Edwards, who criticized Kerry for supporting NAFTA, Kerry received the prized endorsement of the AFL-CIO by insisting he will insure "workers rights" in trade agreements. Kerry also blamed trade for creating "a race to the bottom" among poverty-stricken nations. Kerry voted for President Bush's "No Child Left Behind Act" but now campaigns against it. He says Mr. Bush failed to adequately fund the legislation by not linking student-testing requirements with school funding. Though the legislation requires rigorous testing in the states, Kerry said in August 2004 that the new federal testing mandates were "punitive."